With the flat floor and ultra low ride height, the floor was clearanced and this tunnel fabricated for exhaust clearance. 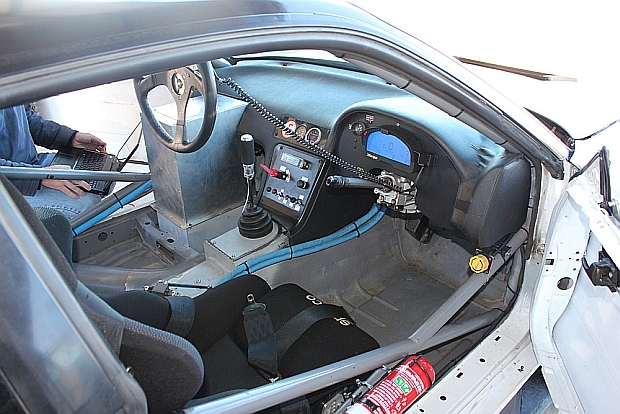 This modification is legal for WTAC as long as the material used to create the clearancing is the same material as the floor was from the factory. In this case that's steel. The cage is thorough with all critical areas triangulated and is tied into the unibody throughout. 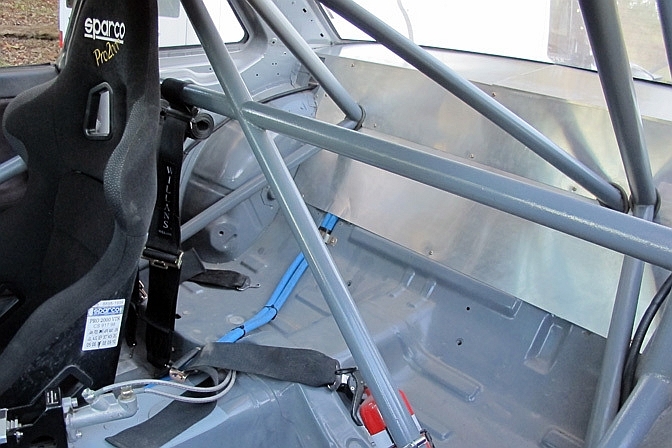 Ex-A1 GP Kiwi driving ace, Earl Bamber, sits in a very low mounted Sparco PRO2000 bucket seat and is strapped in place with a Willans 6 point cam lock harness. Notice the factory gas door/trunk release lever is still used. The factory window seal trim is all there too. The cockpit is simple with everything the driver needs: Sparco L505 steering wheel, sequential shifter for the Hollinger 6-speed sequential transmission, RacePak dash display, Hollinger gear position LED display (shrouded from sunlight for visibility and immediately to the right of the dash), LED shift light (immediately to the left of the dash), Tilton remote brake balance bar adjustment knob (yellow knob on the right), and fire extinguisher. The Hammerhead uses a factory brake pedal that has been modified to work with dual master cylinders. Josh did not have any pictures, but I would have liked to check that out. The two blue hoses are fuel supply and return. For 2012 electric power steering was added. 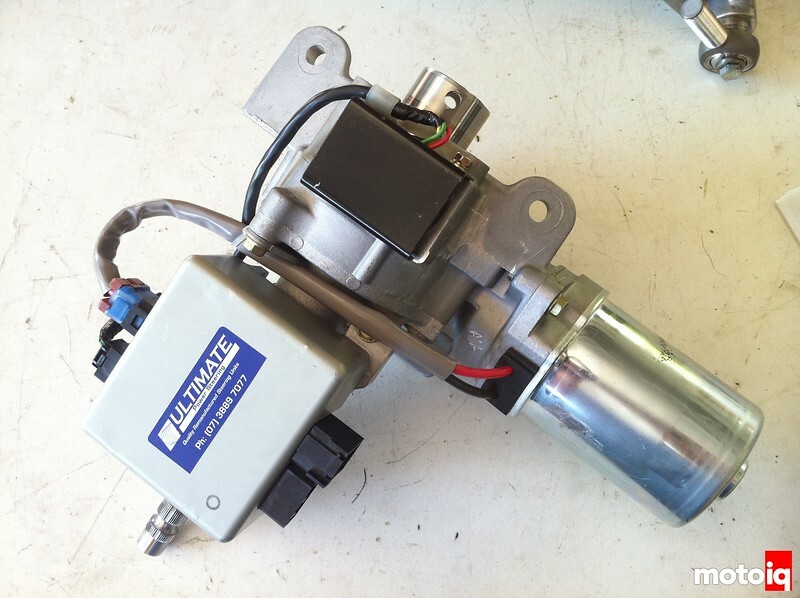 This Ultimate Power Steering motor was added on the steering shaft. 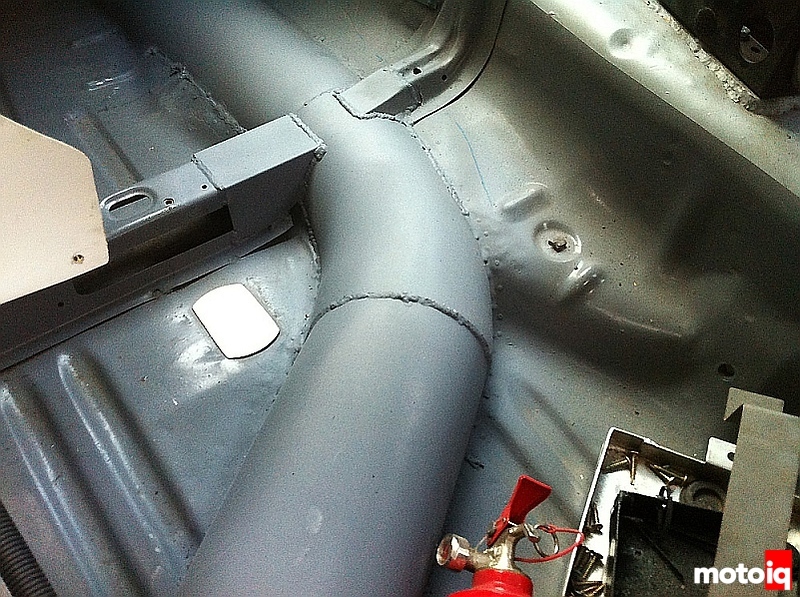 A Peterson Fluid System's 10 quart dry sump tank was placed just behind the dash because there was really no other place to put it. The trunk is full with the wing mounts and fuel cell so the only other place that would allow easy access was here. 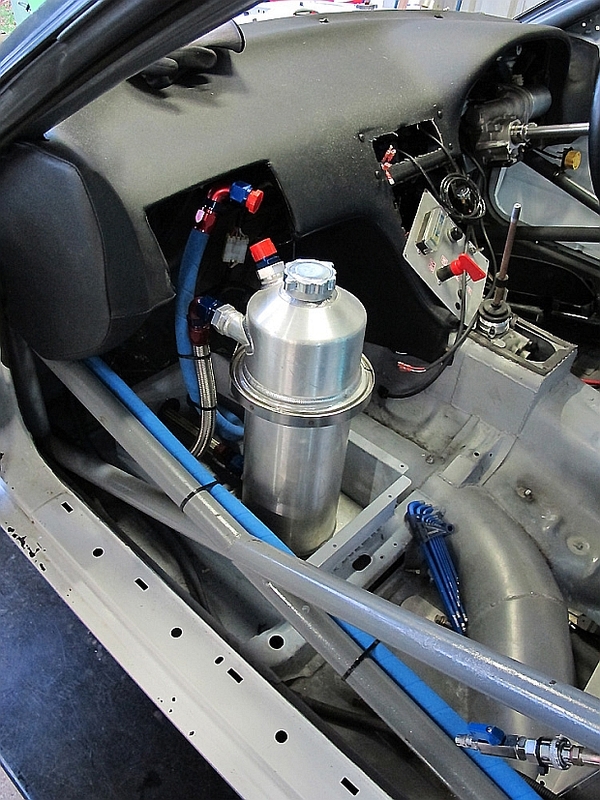 WTAC rules require a container to surround any hot fluids in the driver's compartment. Mike cut the dash out super clean so here he is smiling again!